Ariel Dorfman , Poems from Guantanamo: The Detainees Speak. Poet Martin Espada and attorneys Buz Eisenberg, and Bill Newman (both of whom have represented clients from Guantanamo) will read from this volume of poems written by Guantanamo detainees. Ariel Dorfman was born in Buenos Aires to Jewish parents. His father was an immigrant from Odessa, Ukraine, and his mother from Moldova. When he was a small child, the family left Argentina due to political repression and moved to the USA. In 1954, during the McCarthy era, they moved to Chile. Ariel Dorfman, raised in both countries, became a Chilean citizen. He attended the University of Chile and went on to graduate school at the University of California at Berkeley before returning to Chile. In 1966, he married Angélica Malinarich. He became a political writer and joined the democratic movement that brought Salvador Allende to power in Chile in 1970. He served as cultural adviser to Allende's chief-of-staff. In 1971, he co-authored How to Read Donald Duck, a book that humorous decoded the Disney cartoon as a tool of imperialism. On September 11, 1973, during the coup in which President Allende was murdered, many of Dorfman's close friends and colleagues were tortured and killed. He escaped the country and fled to Paris, Amsterdam, and Washington, DC. Many of his subsequent works focus on the momentous events of his life, human rights abuses, and the horror of political tyranny. Since 1985, he has taught at Duke University, where he is currently professor of Literature and professor of Latin American Studies. He writes regularly for such publications as The New York Times, The Washington Post, the Los Angeles Times, The Guardian, Le Monde, and L'Unità. 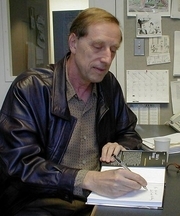 Ariel Dorfman is currently considered a "single author." If one or more works are by a distinct, homonymous authors, go ahead and split the author. Ariel Dorfman is composed of 2 names. You can examine and separate out names.